It’s funny how most people devote hours, days or even months to mapping out a Sales Funnel. They agonising over page colours and image positions. Is the button set a little too far to the left and so many other little details. All the while never considering the Funnel Scripts piece of the puzzle. Now don’t get me wrong getting the structure right is a vital process and you absolutely should take the time to get it right. The thing that gets me every time is after all that time and consideration a very high number of people just put together any old copy and drop it into the funnel pages. 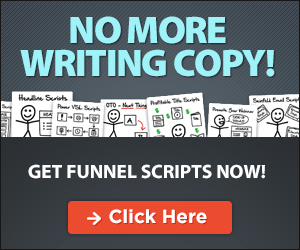 It might surprise you to know that copy is probably the most deadly weapon in your funnel armoury. Good copy persuades, good copy converts, good copy gets the job done. Now I can already hear you saying “but I can’t write copy, it’s too hard and I don’t have a way with words”. That’s ok. We all have our strengths and our weaknesses. The important thing is to recognise that it is your weak point and do something about it. Good copy, no scratch that great copy can turn a failing funnel into a high converting sales machine. The right words on a page can get through to that potential lead or customer and get them over the line. Not only that but once someone has entered your sales funnel you can improve your conversion rate immensely. By combining great copy with powerful and well-planned email sequences you would be amazed what can be achieved. Check out how to do just that using Actionetics.